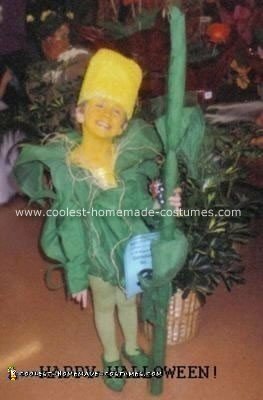 This corn on the cob costume was easy to make, but a little time consuming. For the hat I used an old milk jug cut in half with bubble wrap painted yellow using plastic spray paint. The corn on the chest was an old sweatshirt dyed yellow with bubble wrap glue on using Allenes craft glue. All green leaves (husks) were made using green fabric, green netting, no sew iron on hem strips and wire. Cut out various desired shapes; make enough to go around your child’s body. Sew several leaves together and wrap around for the sleeve. Sew to attach. Lay out one leaf and mesh of same size, add floral wire (sturdy gauge) around edges, fold over edge and use iron for the no sew seams. Use this same process for all leaves. I also added raffia inside to resemble corn silks. Thick white tights dyed green. And cut out leaf shapes out of felt for the feet. Don’t forget the yellow face paint for finishing touch. Awesome idea! Explained nicely! Thanks. I’m pregnant so I’m going to add corn kernels in the front with a hole in my shirt over my tummy and will paint my belly yellow as a kernel. Could you possibly tell me about how much you spent making this costume? I have to make 12 corn costumes for our theater group which is totally non profitable, and I am on a strict budget. I was also wondering if you could possibly write down some more exact explanation and more pictures. It would totally help because this is a great costume and so adorable. My corn costume is WAY better. i cant believe you people think this is anywhere close to good.